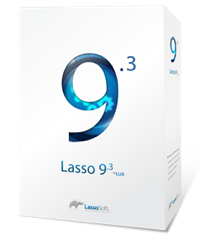 Lasso ships with native connectors for the most commonly used databases, as well as support for connecting via third party ODBC drivers. Combined with LDAP support and the ability to create custom datasources, Lasso can connect to just about anything. Lasso makes it easy to access data from many different datasources using a common query language. The same code can be used to access MySQL, Oracle or even FileMaker. Lasso automatically generates SQL statements or datasource-specific commands to perform database actions. This is sometimes referred to as a "database abstraction layer." Hand-crafted SQL statements can also be used to access advanced database features. Results are automatically parsed by Lasso, and a rich collection of methods found in the LassoDocs Language Reference make it easy to format the results as HTML, XML, JSON, or any format desired. Query Expressions allow the results to be further refined or sorted within Lasso.